We have been thinking about discovering unique, local, food dishes and have come across a few sites we find extremely innovative and helpful. In the very near future, we at tapviva hope to work with all the companies below to provide comprehensive restaurant and dish reviews throughout the tapviva ordering process. SporkHub – Find local top dishes, add your own critique and share with friends. Create a to-do list of dishes you would like to try. Can also access online. Available for the iPhone. 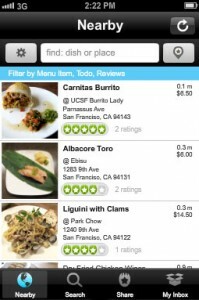 FoodSpotting – Find local dishes, then mark it was “want” and/or “nom”. Search for similar dishes. Create local food guides using already created dishes, or have a gorgeous pictorial view of well known guides such as the 7×7 Big Eat guide. Available for iPhone, Android and web. Chewsy – Use GPS technology to find local dishes; get ideas for what to order before you arrive at a restaurant. And now, add pictures to any dish. Currently available for iPhone. Grubcrawl – A social tour of local restaurants. Visit three different restaurants on a tour, and try three unique dishes. Make new friends along the way. Urbanspoon – Sort by type of food, price point and neighborhood, the app returns restaurants that meet your criteria in a slotmachine type interface. Focus on discovering new restaurants, no emphasis on specific dishes. Use the app on iPhone, Android and Blackberry. Please let us know which of these apps/sources for local food discovery you use and why! Are there any that we missed? Please share! Take a break from your Tuesday with a local dessert food truck. Today we turn to Washington DC, here are a few we follow on Twitter and cannot wait to try when we are back east! PleasantPops (@pleasantpops) Mexican, fresh fruit ice pops made from local, sustainable ingredients – over 40 available flavors. Check out the PleasantPops story too! 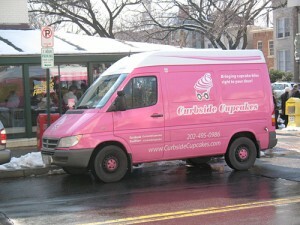 Curbside Cupcake (@curbsidecupcake) Great for private events and cupcake deliveries. Sign up for their email list to know when they will be in your neighborhood. Lookout for the pink truck to know when they are in the area! DC Pie truck (@dcpietruck) Pecan, custard, key lime, pumpkin, cherry, raspberry, blackberry, apple, peach, chocolate peanut butter pies and more, is this the only truck out there doing pies? We love this delicious idea. Sweet Bites truck (@sweetbitestruck) Cupcakes, bars & cookies, scones, muffins, pastries, coffee and tea. Basically, this truck has something for every type of sweet tooth. We want a Buttery Sugar Cookie. Cupcake Buggy (@cupcakebuggy) Try creative flavors like Peanut Butter N Jelly and Strawberry Lemonade, plus lots of gluten-free and vegan options (very appreciated!). Sweet Flow Mobile (@sweetflowmobile) Salads and tart, fat-free, all-natural yogurt. Check out their awesome website. Please let us know any we missed – and what sweets we should try from each truck! InboxQ is a neat tool we use to find questions on Twitter relevant to our business, industry and products. We first heard about InboxQ from this Forbes article. It is simple and free to set up - InboxQ is a browser plug in that works on either Chrome or Firefox. We downloaded it from the Chrome app store and it now lives on the top of our browser. Through the InboxQ drop down menu we are able to set up campaigns with keywords focused on our industry, business and products. We are notified whenever a relevant question is asked on Twitter about any of our keywords or campaigns. It is a simple way to keep track of searches. Are you using InboxQ or anything similar? Please share your experience! We are excited to see companies that move forward the archaic restaurant point of sale system. While tapviva is working on ordering for restaurants, cafes and food trucks where you order at the counter, we also like to keep track of seated restaurants. One huge innovation here is with seated touchscreen menus. Two touchscreen menu companies we are impressed with are ElaCarte and MenuPad. ElaCarte (see Mashable article) is utilizing Presto tablets for table ordering. The Presto tablets have a full day battery life, built in credit card reader and are able to withstand heavy usage and handling. The on-table tablet allows customers to order, pay and play games while waiting. In tests, customers using the system spent 10-12% more than other tables not using the system. The first table touchscreen menu we heard of was MenuPad in Australia. MenuPad is iPad based, and allows restaurants to created customized, branded table menus. MenuPad integrates with your existing POS, or receipt printer. Looks elegant and fun. We are looking forward to testing these out in the near future – have you tried any of these systems? Please share a review, or anything we missed. We are excited to preview our technology in this demo video! Please contact us to learn more about how tapviva can work with your cafe, restaurant or food truck! Thank you so much to Curtis + Ben @cremebruleecart and Trevor @dirtywaterwear! Original Theme: Bueno by WooThemes. © Copyright tapviva 2019. All Rights Reserved. Read about our legal policies.